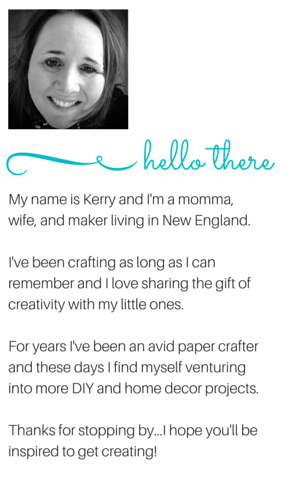 Peonies and Paper Chains: Kiss Me, I'm Irish!, PLUS a new embossing tool! Kiss Me, I'm Irish!, PLUS a new embossing tool! Perhaps it is a bit early to go around shouting "Kiss me, I'm Irish", however it is not too soon to start thinking about decorating a little for St. Patrick's Day! Don't celebrate St. Patrick's Day? Not a problem - you can apply the same ideas I used for a little colorful everyday decor or to mark another occassion! Grab an old towel or a platic backed table cloth that you don't mind getting stained and place this on your work surface. Determine an arrangement that you like for the banner pieces and then spread out so you can sprtitz color onto the various pieces. Fill your Stampin' Spritzers nearly to the top and add about 20 drops of from your Old Olive re-inker into one spritzer and from the Coastal Cabana re-inker for the other spritzer. Spray the 3 canvas hearts first with Old Olive to get really saturated color. Spray your banner pieces with the appropriate colors. Once these dry, determine if you if you like the color and repeat process if you want a darker shade. I did re-spritzer the Old Olive pieces but left the Coastal Cabana with the single layer. While your pieces are drying, cut 3 pieces of Gold Foil that measure 2" x 4-1/2" and emboss. I used the Decorative Dots Textured Impressions Embossing Folder (another Sale-a-bration exclusive), however you could use any folder of your choice -- small pattern will likely look best. Punch or cut a 2-1/2" circle. Once your banner pieces are dry, staple the embossed gold pieces to the backside of the banner pieces with the heart cut outs and then staple the 3 canvas hearts and the gold circle directly onto one of the triangular pennats. Use the needle and Linen Thread from the kit to string together your pennants and the felt belts. This banner was briefly displayed for taking photos and now it is tucked away until after Valentine's Day when it will replace the Monster Hugs banner. In addition to having fun putting together the banner to share with you, it also spurred conversation about shamrocks and being Irish. I told the girls about their great, great grandmother Myrtle Goldie (Maxwell) Rattigan who had an incredible ability to spot 4 leaf clovers! And Brooklyn declared the she and Britt are Irish because they can Irish step dance...since I thought that being part Scotch meant that I was part Scotch tape when I was little, guess I can't argue with her logic! Stampin' Up! has a new video about the Heartfelt Banner Kit that you may enjoy...have a look! Did you notice that I mentioned a new embossing tool in the post title? For those of you who do not have a Big Shot or perhaps would be interested in a smaller, more portable tool, you may want to consider the new Texture Boutique Embossing Tool! Click to see the Texture Boutique Embossing Tool in action! Thanks so much for visiting today! Be sure to come back tomorrow to see the other pieces of the Heartfelt Banner Kit in use for some cards!